The Howling 3 is a bad movie, and I kind of like it. The first half anyway. Whereas the second movie in the series was bad and kind of dull this one is bad and weird, which is much more entertaining. Really, the fact that the werewolves are marsupials (if you hadn’t guessed from the title) isn’t the weirdest thing about it. 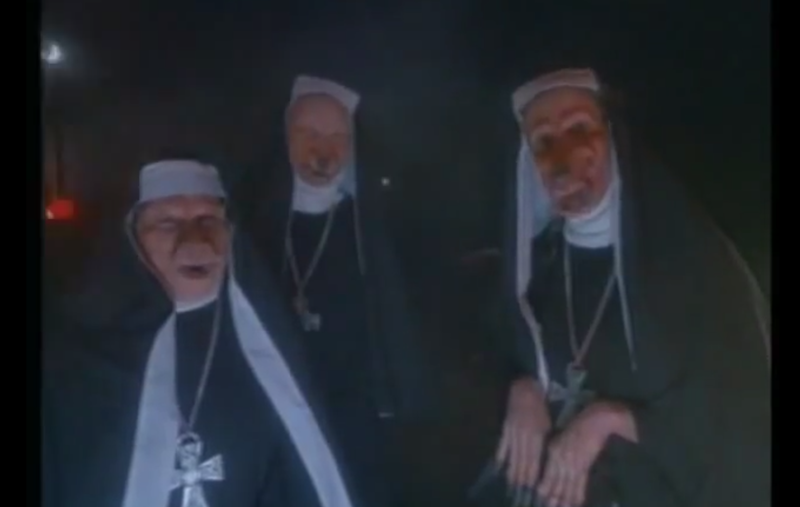 Nor are the marsupial werewolves dressing up as nuns. Unfortunately, while the first half of the film moves along at a fair pace with the movie poking fun at itself, once the characters start running around the Australian bush things slow down and takes another weird turn into bizarre drama. Still worth watching to find out where it leads, but not as much fun as the first half. This entry was posted in Movies and tagged Australia, dame edna, HHMMS2014, horror, marsupials, weird, werewolves. Bookmark the permalink.